Do you love golf? Do you want to give your guests something to talk about? 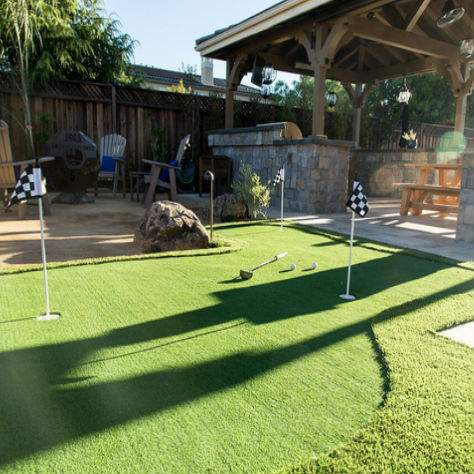 Consider adding a putting green to your yard. Putting greens are a great way to entertain guests, enjoy some relaxation outdoors, and they are also easy to maintain. Whether you want a single hole or multi hole putting green installation, our guys are up to the task. For more information, call us today to schedule a consultation and see whether or not a putting green is right for your home. We offer professional putting green installation services to our customers. Our team uses high grade synthetic turf, which won’t get muddy, need mowing, or turn brown in the summer. Putting greens are a great way to conserve water when you swap them out in place of real grass, but they also offer added fun and functionality that plain old synthetic turf is lacking. We are also happy to install a new putting green or bocce ball court as part of a larger landscape design project. 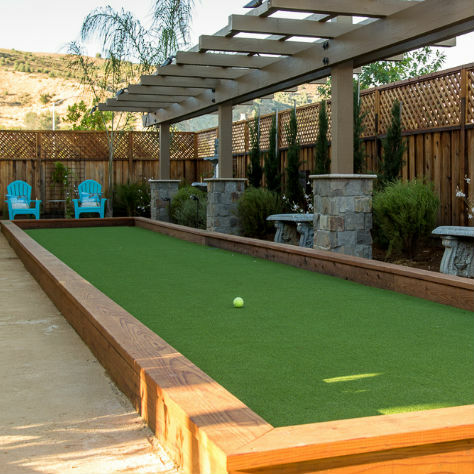 Another great way to add fun and eccentricity to your backyard is to opt for a bocce ball court instead of traditional grass or rock. Bocce ball is a fun sport for all ages and all backgrounds, and our courts don’t take much in the way of maintenance. Add some spice to your yard while also cutting down on maintenance and water costs. Call Exotic Gardens today and ask about bocce ball court installation in Morgan Hill and nearby areas.